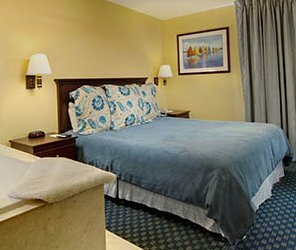 The Monterey Bay Lodge is a conveniently located hotel in the heart of Monterey, California. Our beautifully appointed, beach themed hotel is located across from Lake El Estero on Camino Aguajito and just steps from Monterey State Beach and a short stroll to Fisherman's Wharf and Downtown Monterey, CA. The Monterey Bay Lodge is a quaint lodge with lush landscaping; as you stroll through our majestic property, you will enjoy the quiet ambiance of a tranquil hotel while being located minutes from Downtown Monterey. 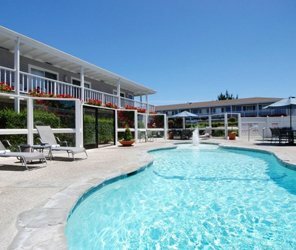 The Monterey Bay Lodge features a uniquely shaped heated pool and spa that is surrounded by 46 guest rooms. Our heated pool and garden area with blossoming landscaping are open year-round and even features a fountain for kids to enjoy while you relax in our spa. Complimentary parking with many rooms featuring assigned parking is available for our guests. Our front desk and friendly reception staff is available to you 24 hours a day to make sure your stay in Monterey is a memorable one. Guest satisfaction is of utmost importance for our staff, and we strive hard to provide a memorable stay while visiting Pacific Grove, Carmel by-the-Sea, and Monterey. The Monterey Bay Lodge guest rooms come with free Wi-Fi and cable TV with HBO; in addition, these charming rooms also include an in-room safe. The 46 units consist of 2 Family Rooms & a single Bedroom Suite with a Full Kitchen; in addition to a collection of rooms with queen and king beds. Some of our Monterey hotel rooms feature fireplaces, patio access, and whirlpool spa tubs. All of our guestrooms are ADA Defined service-animal friendly. All rooms feature microwaves and fridges, and Serta Presidential Suite pillowtop beds. If you are doing business in Monterey or just traveling for leisure, our quaint hotel will provide the ideal accommodations for you in Monterey. The Monterey Bay Aquarium and whale watching tours are both a 5-minute drive from the Lodge. The Presidio of Monterey Museum is a 10 minutes drive, and the Monterey Peninsula College is a 10-minute walk from the hotel. The Naval Post Graduate School is within 1 mile. 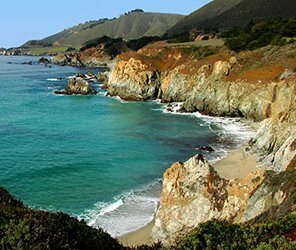 Located off the Downtown Monterey exit on Highway 1, Monterey Bay Lodge is just minutes from Carmel and the world famous 17 Mile Drive. If you are looking for a central base while exploring Monterey, Pacific Grove, Seaside, and Carmel our boutique style hotel is the ideal choice.